No matter how hard you try to stay on top of everything, kitchen clutter is basically inevitable. One day, your kitchen is a picture of cleanliness, the next, it looks like a dump, and you have no idea what happened in between. It doesn’t seem to matter if your kitchen is massive or on the smaller side, clutter can get the best of even the most organised person. So, whether you’re simply struggling to find the optimal method of arranging your cutlery drawer, or your bench is packed with more pots and pans than you know what to do with, our 10 clever kitchen storage solutions can help you declutter your kitchen, saving you time, space, and a whole lot of mess. You’ll thank us when you don’t have to search through ten different cupboards just to find the sugar! First things first, when it comes to decluttering your kitchen, no space should go to waste. Pause, take a deep breath, and take stock of your kitchen. Really take stock. Where are the unused spaces? Could that empty cupboard or that unused stretch of benchtop be put to better use? It doesn’t matter how much space you have, what matters is that you make the best possible use of it! Your kitchen’s potential storage space doesn’t stop at your eyeline. The sky’s the limit! Or, in this case, the roof. Utilising your kitchen’s vertical space can be a total game changer. 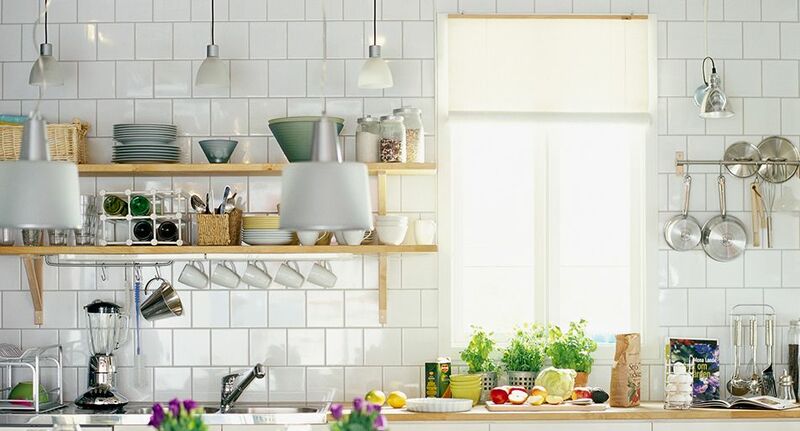 This doesn’t necessarily mean dangling cumbersome items from the ceiling that you’ll inevitably bang your head on, but filling up awkward spaces on walls, ceilings, and above cupboards is a great way to unlock your kitchen’s full storage potential. Whether it’s a good, old-fashioned fridge magnet or a magnetic storage container, magnets can be an absolute lifesaver when it comes to kitchen storage. Ideal for filling up tricky, unused spaces, sticking a few magnetic containers onto your fridge can go a long way towards organising anything and everything, including pantry staples, spices, and even knives and forks. Roll up, roll up, because kitchen trolleys are a simple storage lifesaver. The best part about kitchen trolleys is the flexibility they afford you. Here one minute, gone the next! You can roll the trolley into your kitchen whenever it’s required, but if the kitchen starts to feel a bit cramped, you can roll it right back out. Most kitchen trolleys also come with handy drawer space, plus room for chopping boards if bench space is running low. A lot of our suggestions require you to think slightly outside the box, however, just this once, we’re asking you to think inside the box. Boxes and containers are a must for any organised kitchen. Not only do they let you keep similar items in one, easy to access place, but they’re also a more efficient use of space. Rather than mashing several misshapen items into a cupboard like a failed game of Tetris, it’s far better to pack a container and slide it neatly into your drawers or cupboards. If you do choose to follow our advice and think inside the box, then clear containers are the way to go. Instead of opening and closing every container in your kitchen just to find one tea bag – ruining your newly arranged cupboards in the process – clear containers allow you to find whatever you’re looking for with a glance. Clear containers are particularly useful for pantry staples like salt, sugar, and flour. In a well-organised kitchen, cabinet doors can serve an important purpose beyond just opening and closing. Following our ‘no space goes to waste’ principle, the backs of cabinet doors are an often-overlooked but extremely handy storage solution. Appropriate for anything from cleaning products to hand towels to spices, a few hooks or hanging strips can transform your cabinet doors into a storage wonderland. If you’re really struggling for kitchen space, you might have to look abroad. In other words, move some items from your kitchen into other rooms in your house. However, to avoid disrupting the flow of your kitchen, you’ll need to strategize. For a week, take note of the items you use most frequently, as well as any items you don’t use at all. Prioritise available storage space for items you use frequently, and move items that you barely use into a room where you have free storage space. They’ll still be there when you really need them, and you’ll clear plenty of kitchen space while you’re at it. You can optimise your kitchen storage as much as you want, but cleaning will always be a necessity. Rather than storing dishwashing liquid under the sink, paper towels in the top drawer, and cleaning spray who knows where, eke out a dedicated cleaning corner to ensure all cleaning essentials remain in one place. After all, it’s much easier to organise a clean kitchen. This one might seem obvious, but it’s so important that it bears emphasising. In fact, we might have saved the most significant storage solution for last. Relying solely on your kitchen’s pre-existing storage space will only get you so far. If you have the room, installing extra shelves can unlock a whole world of possibilities. All of a sudden, you can see your benchtop again, your coffee mugs finally have a proper home, and there’s even room for some cute decorations!